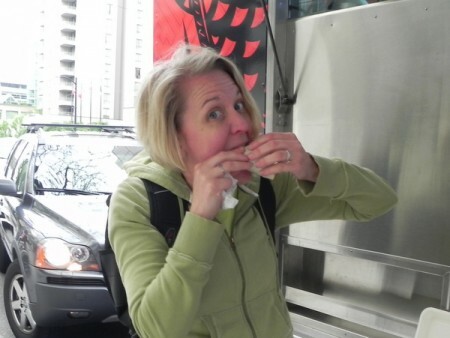 I’ll state my position from the outset: I believe that gourmet food trucks should come to every town in North America. There really couldn’t be a better family dining option, especially in a city like Vancouver where you might find four or five completely different choices within a few city blocks. Got a meat-loving child? There are trucks selling barbeque or tacos or rotisserie sandwiches. Or maybe someone really prefers veggies – you’ll find salads and stir fries too. And of course the option to eat on the go is perfect – no need to really stop what you’re doing, no need to even sit down if you don’t want to. You can grab meals and snacks when you feel like it and be on your way to bike around Stanley Park. 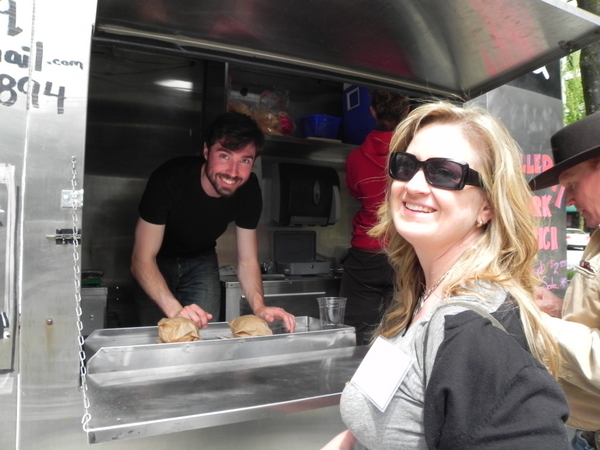 I was pretty busy when I was in Vancouver, but I did manage to check out two of the food truck options. Amy Whitley of Pitstops for Kids was my lunch date and she is a vegetarian, so we hunted down the Roaming Dragon truck on the corner of Robson and Burrard Streets. I had the Korean short rib taco, which came served in a corn tortilla and topped with sautéed spinach, shitake mushrooms, carrots and bean sprouts. 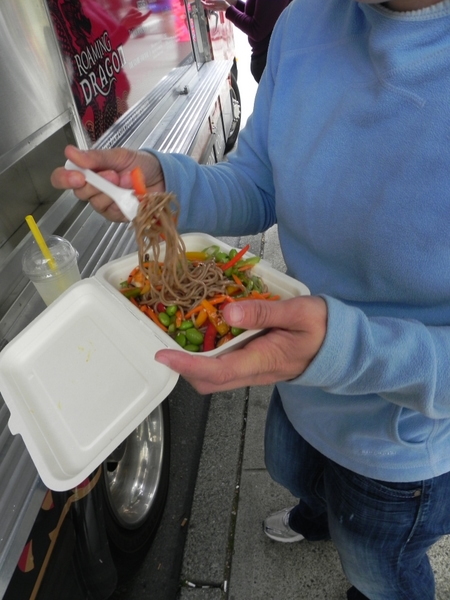 Amy tried the soba noodle salad which had a sweet soy-ponzu dressing. And we both had the lychee-basil lemonade, which was almost a food itself. I’ve never had lemonade I could actually chew before, but this was delicious and completely refreshing. The next day I lunched with Corinne McDermott of Have Baby Will Travel, who like me is an avowed carnivore. 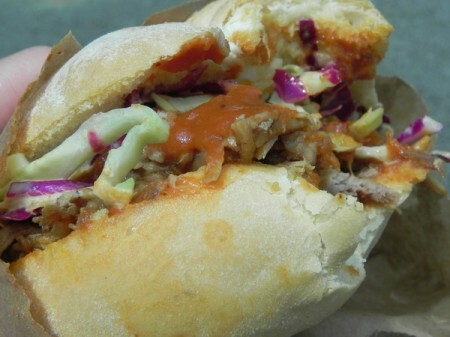 We headed over to the plaza in front of the Vancouver Art Gallery (which just happened to be right across the street from the Four Seasons, where I was staying) for pulled pork barbeque sandwiches and homemade rhubarb soda at Re-Up BBQ. This is the kind of sandwich where the coleslaw comes right in the bun. It was smoky and delicious. Another thing about these food trucks that makes them great for family dining? You can satisfy your hunger for between five and ten bucks. And most of them are totally hip and tech savvy and use websites, Twitter, and Facebook to let people know where they’ll be and when so you can find them using your smart phone while you’re out and about (you’ll find the two examples I mention above on Twitter @RoamingDragon and @reupbbq). One food stand I didn’t get to try while I was there, to my deep disappointment, is Japa Dog, where they sell hot dogs and bratwurst topped with items like nori and fried cabbage (they also offer plain hot dogs for the less adventurous). I consider this alone a definite reason to return! I share this for Wanderfood Wednesday at Wanderlust and Lipstick. Oh man, this beats the burger vans you find in Edinburgh..
ZOMG, that looks so tasty-delicious. I would love to have a roving taco van driving the streets of Melbourne. You kidding me!?! This looks like so much fun! I could spend all day sampling various snacks. I’m embarrassed to admit that we haven’t tried any of the food trucks in Austin, even though we live nearby. I’ll add it to my summer to-do list. LOVE the food trucks in Vancouver! A great eating option in a very walkable city. These sure look so yummy!! I didn’t try those 2 options you did but I did eat at Japadog a few times. 🙂 Love love food trucks! Just in the last year, Indy has gotten a few food trucks. I haven’t had a chance to try them yet, but they are getting rave reviews. It’s an especially great concept for parents of toddlers who still want to eat great food while traveling but have little ones who struggle to sit still at restaurants! Loved the food trucks! Portland, OR has great ones, too, but in all of NYC this week, we only saw the standard pretzel and hot dog variety. I’ve seen one in Boston (gourmet grilled cheese!) but no others. Is it a West Coast thing, I wonder? Obviously, they aren’t as ubiquitous on the West Coast, but they are there! I love food trucks! I used to seek them out every once in awhile when I worked in D.C., especially the truck that served cupcakes! What a treat! Looks like the food trucks in Vancouver are worth visiting too. I’ll have to keep that in mind if I ever get the opportunity to travel there. 18 hours ago by motherofalltrips Window, Mystic.